We want all of our patients to have the opportunity to live a cavity free life and we use the CAMBRA program to help our patients achieve this. CAMBRA stands for CAries Management By Risk Assessment. This means that we will not only diagnose and treat your cavities, but we will determine the underlying cause of your cavities and make recommendations so you can prevent cavities in the future! Why do we use CAMBRA in our practice? Quite simply, we want the best for our patients. In order to provide the best restorative dental care, we must provide the best preventative care. If a patient is prone to getting cavities and we do nothing to address the underlying cause … not only will they continue to get cavities but they will also be more likely to have failures of expensive dental work. Any dentist performing CAMBRA will include treating the cavity-causing bacterial infection in addition to any needed dental work. Our CAMBRA program incorporates 3 easy steps in to your check up appointment. SWAB OF YOUR TEETH: Second we will to a quick and painless swab of your teeth. 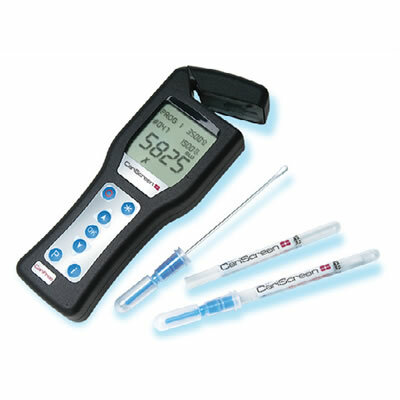 Our office uses the Cariscreen meter to check the levels of bacteria in your mouth. This one-minute test uses bioluminescence (without any discomfort to you) to identify levels of bacteria that could contribute to tooth decay. We will put our exam findings together with your answers to the questionnaire and your swab score to determine your risk level for getting future cavities. This will allow us as to make recommendations on how to lower your risks. Sometimes our recommendations make include prescription strength or professional strength products.Other recommendations may be targeted at diet or types of foods that you eat. These recommendations will be tailored specifically for you! We have partnered with Carifree to provide effective products that help preventing cavities and reducing the outbreak of oral disease. We will use the results from our CAMBRA screening to determine if any of these products are right for you. Ask us about these effective products on your next visit or visit Carifree to learn more details about them. CTX4 gel – is a prescription strength toothpaste that we love. It not only has a prescription strength fluoride, but it incorporates several other ingredients to help prevent cavities. It is a pH neutralizer which will help to neutralize acids from cavity causing bacterial. It contains xylitol which can help to stimulate salivary flow providing comfort and extra cavity protection for those patients that experience dry mouth. It also contains Calcium and phosphate (nano-hydroxyapatite), which in combination with the fluoride, helps to remineralize areas of early cavities. CTX 4 Treatment Rinse – is a professional anti-microbial rinse. This rinse may be recommended if the Cariscreen meter indicates a higher level of bacteria in your mouth as an increase in bacteria can lead to an increased risk for getting cavities. CTX 12 kit – Contains the prescription strength ctx4 gel.